Come April, live music’s holy days commence in Southern California. Coachella is widely recognized as the start of festival season, thus it serves as the western world’s kick off to all that comes with the deserved respite of spring and summer months. Many rock n’ roll pilgrims journey from around the world to attend the festival, while others begrudgingly tune in via webcast. Many more follow along vicariously via press or social media. Suffice to say, all eyes (and ears) of the musical cognoscenti and beyond point to the desert with that special sense of holiday anticipation. Those in the area have become privy to what is now known as “Localchella,” an avalanche of shows held during a three week span surrounding the festival, taking place from LA proper, to San Diego, to Joshua Tree. These performances offer artists a chance to warm up before their big stage gigs, or perhaps a way to constructively (read: profitably) spend the week before, in between, or after the two weekend behemoth that Coachella has become. Monday night in Pomona, then, saw the lighting of the holiday’s first candle, the proverbial tree, or in actuality, a disco ball, suspended high above the stage of the Fox Theater. LCD Soundsystem, the beloved electro dance punk band from NYC, recently announced that they would regroup after nearly five years apart. Save for two hometown gigs in Gotham two weeks ago, Monday was LCD’s bona fide return to the road. Announced only three days in advance, most tickets were sold at local record stores. This short notice gave fans a near vertical ascent of collective anticipation that lasted from Saturday morning’s on-sale, straight through to Monday evening, as they anxiously poured in to the Fox. There would be no opening act, and this felt appropriate. The preshow house music was particularly booming, the stage littered with instruments. Some would qualify as analog, while other appeared lifted out of a mad scientist’s lab, or a Space Odyssey. The performance had yet to begin, but the devices already displayed blinking lights; tell-tale signs of beeps and boops to follow. Upwards of ten microphones were arranged among the set-up, evoking the sight of construction cranes towering over a city’s rebirth. 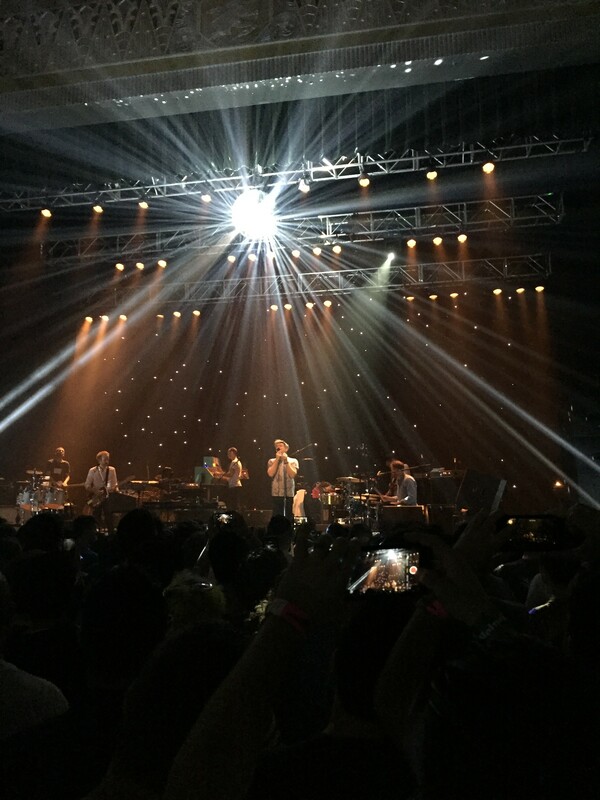 When the lights finally went down, the long lost band emerged a few members at a time, with the final entrance, of course, belonging to front man and LCD co-founder James Murphy. Still disheveled, still in a trademark blazer, Murphy still resembles the late Philip Seymour Hoffman. Time was not wasted, as the band opened with “Us V Them.” Immediately, it was a departure of the course of events at the two NYC shows, each of which started with “Get Innocuous!” – a song that would be played later in the Pomona set. During “Us,” Murphy cradled the microphone like a ghost dance partner, singing lyrics perfect for the resurgent moment, “The time has come, the time has come, the time has come today.” Later in the song, the especially blinding disco ball made its own brilliant entrance. 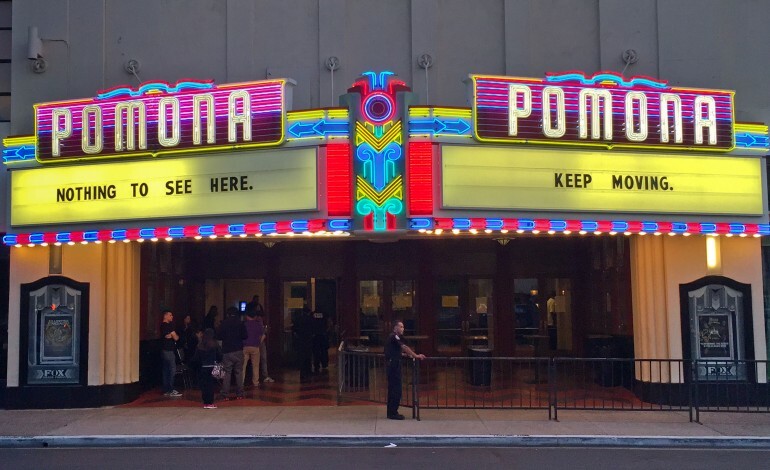 Murphy remarked after the song that the band wanted to play Pomona because it reminded them of when they used to play in venues that were in the towns that are next to bigger cities with the bigger venues. The populist anecdote brought a roar from the audience, as Murphy doffed his sport coat. “I Can Change,” a song of affirmation, beckoned the sound of Talking Heads, as the band members interplay veered quickly from punk to funk, and back. Throughout the show, the total players on stage fluctuated fluidly between six and ten. Murphy introduced keyboardist Nancy Whang, whose high pitched vocals on “Sound of Silver” (a song not played at all in NYC), were met with a trombone blast from the two-man horn section tucked away in the back corner. The song evolved in to a spacey passage, later accented by more subtle horn additions. Although the stage and light design never exceeded the glam of the single mirror ball, the understated set up was artful and appealing, even when a backing wall of scattered Christmas sized lights faded simply from white to red to blue. “Yeah” was a furious and bone crushing banger. As the band incessantly sang the repetitive lyrics of “yeah, yeah, yeah, yeah, yeah, yeah, yeah, yeah, yeah, yeah, yeah….,” one green fan was overheard asking if the song was called “Yeah.” His friend deadpanned the response, “Yeah.” Laughs. The set-closing trio of “Losing My Edge,” “Home,” and “New York, I Love You But You’re Bringing Me Down” was stunning. “Losing” carried out the promise suggested by its title, unfolding as frenetic, scratchy, and neurotic. “New York” – probably the high water mark for devoted fans’ desperation since it closed their final show in 2011 – suddenly felt more triumphant, ending the set with a soaring guitar solo. The encore included more precise percussion during “Yr City’s a Sucker” off of their 2005 self-titled album (it was the other song only played for Pomona). “All My Friends,” an anthem among anthems, ended the show. The audience in the pit was sent in to one final fit of hysteria, jumping, fist pumping and surging towards the stage, as LCD Soundsystem charged right back at them. It would behoove any uninitiated Coachella attendees to experience LCD’s headlining set Friday night on the main stage. Their own brand of electronic dance music is arguably more soulful, human and earnest than the dominating and jarring laptop EDM that will surely echo far beyond the confines of the Sahara Tent.